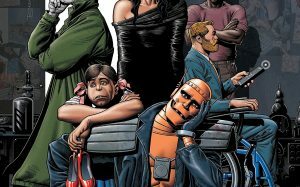 The TV series about the Doom Patrol superhero group: Robotman, Negative Man, Elasti-Girl and Crazy Jane led by the mad scientist Dr. Niles Caulder. They are all people who suffered a trauma that disfigured them and at the same time gave them superpowers. They are therefore a band of freaks with super powers who join forces to defend a world that wants nothing to do with them.